Tonight we served the first of many cream pies at a dinner party. Jim suggested a few tweaks, reflected in the ingredient below, but I am putting off making another Strawberry Cream Pie until we complete the many other pies on our list. Preheat oven to 450 degrees-F. Remove tops and slice strawberries, set aside. Spray a 9-inch metal pie pan with cooking spray. Roll pie crust, place in prepared pie pan, and crimp edges. Pierce pie crust 20 to 30 times with a fork. Place pie weights or dry beans in the pie to prevent the crust from contracting. Bake for 10 minutes. Remove pie weights from the pan and cover edges with aluminum foil to allow the bottom to brown without burning the edges. Return to the oven and cook for an additional 5 minutes. Remove from oven and let cool to room temperature. Place gelatin in a small bowl with the cold water and set aside. Combine gelatin and water mixture, cornstarch, sugar, and 1-1/2 cups sliced strawberries in a medium sauce pot. Bring to a boil over medium heat for 2 to 3 minutes, stirring while the sauce thickens. Set aside and let cool to room temperature. 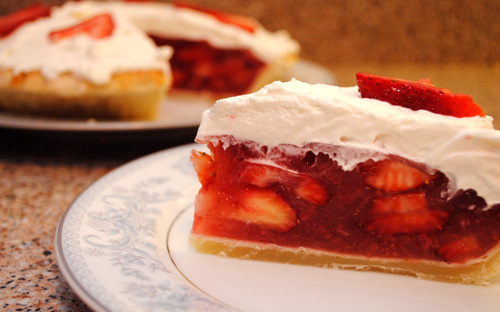 Pour remaining strawberries in the pie crust, reserve several slices for decoration as desired. Pour strawberry sauce over the strawberries. Cover pie with aluminum foil and chill in the refrigerator for at least 2 hours, preferably overnight. Spread whipped cream on top of chilled pie and decorate with reserved strawberry slices. Serve cool and store in the refrigerator. Wonderful pie – can’t wait to eat it again.